Individual permission settings can be copied within the list by simply dragging the onto another permissions item. Drag the permission to another item in the list and release. You can add the copied settings to any item. Navigate to the page you want to apply the permissions to, view its permissions and go to the botton of the list. You'll now see a second button. Click Paste to apply all the permissions you copied from the first page to the current page. 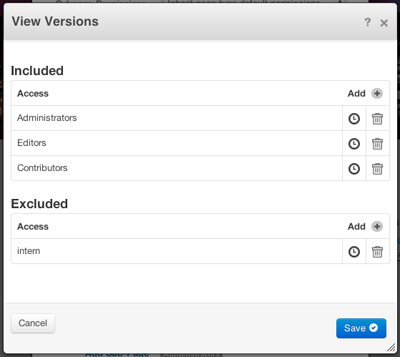 Permissions may be edited by clicking on the name of the permission in the list on any page set to assign permissions manually. Access Entities are the users, groups and combinations that you want this permission to apply to. Upon clicking a permission's link, you'll see a list of access entities currently selected for this permission. Click the Add button to show the Add Access Entity dialog. To add an entity, click the Select dropdown menu, and then choose from Group, User, Group Set, Group Combination, or Page Owner. 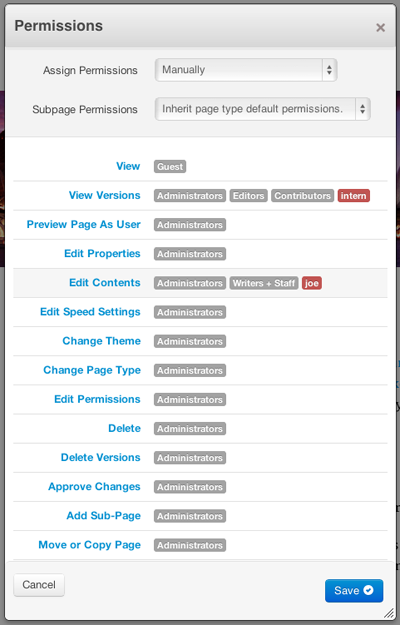 In the example above we've granted access for any users in the Editors or Contributors groups. We've also specifically excluded an individual user named "intern" from being able to access this permissions item (View Versions). When inspecting a page's Permissions, excluded access entities appear in red. It's important to note that in the example above, "intern" won't be able to access this permissions item, even if ther user is a member of the groups which have been granted access. Each type of entity can be included or excluded in a permission. These entities are the individual user accounts set up in your site. The permission can also be applied to a specific group of users (as defined by Dashboard > Members > Groups). The permission will apply to all members of the group. Group Sets are used to gather separate groups into a single entity. Group sets are defined at Dashbord > Members > Group Sets. A user will have access to this permission item if they are a member of any group in the set. Includes members of two or more groups who belong to all of the groups. For example, if Group A contains User 1, and Group B contains User 1 and User 2, only User 1 will be included when Group A and Group B are used in a Group Combination. This allows the setting of permission to the user who is currently set as the owner of the page.